"What's remarkable about this debut is that its mystery takes place within a culture that is largely under wraps ... The thriller plot is well-placed. But it's the individual journeys of Nayir and Katya, who abide by society's strictures even as they are frustrated by them, that elevate Finding Nouf to a larger human drama." "[Ferraris] weaves a richly detailed tapestry of the country's gender-segregated and pious Muslim culture." "A finely tuned character study ... both particularly well-crafted and readily accessible for American readers. Just make sure you turn up the air-conditioning before sitting down to read." "Ferraris writes with authority on how Saudi insiders and outsiders alike perceive the United States ... With equal authority, she stakes her own claim on the world map, opening Saudi Arabia up for mystery fans to reveal the true minds and hearts of its denizens." 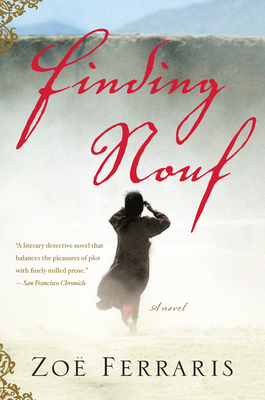 "In Finding Nouf, first-time novelist [Zoe Ferraris] gives us an imaginative and closely observed murder mystery set in the Saudi port town of Jeddah, a literary detective novel that balances the pleasures of plot with finely milled prose ... As a good detective novel should, Finding Nouf visits all the nooks and crannies of society ... Characters a lesser writer would skim over with a few generic adjectives come alive in Ferraris's hands and pull you into their world. But what truly sets this book apart from a detective novel is its prose." "The author's canny move using the tried-and-true murder mystery format allows her to sketch a trenchant portrait of Saudi society within an engaging yarn." "Finding Nouf, Zoe Ferraris's engrossing debut novel, yanks the veil off Saudi Arabian culture while unraveling a compelling murder mystery." "Reads like a breeze ... Ferraris offers a fascinating glimpse inside domestic Saudi Arabia. Even better, she has written a fascinating thriller, not only an academic treatment. Finding Nouf turns out to be a great beach read."